Do not let dust take over your house! Our air duct cleaning services can help you enjoy a much more healthy indoor environment. No matter what size or type of ductwork you have, our technicians can clean them to perfection, and even repair them if it proves necessary. 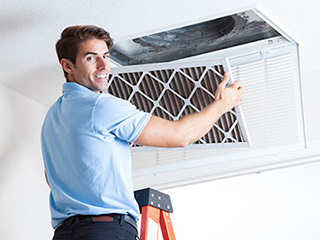 As experienced HVAC and air duct cleaning specialists, there is no issue our professional team can't handle. If you have noticed dust and pollen entering your home through the ventilation system, or if a strange odor seems to be spreading from it, contact our team straight away and let us take care of the problem. The last thing you want is for your air ducts to be harboring some nasty residues that aside from smelling foul, can also be a health hazard. The initial inspection we'll perform will show us what kinds of contaminants are present in your air ducts. Any damage to the ductwork itself will be duly noted as well. If there is a need for seal repair, for instance, we'll get it done without delay. The seal is essential for preventing the entry of new contaminants into the system, as well as keeping fresh air from escaping. Therefore, your system's efficiency will be greatly increased after our repair work is through. The professional air duct cleaning techniques we'll use on your system will be determined by the nature of the contaminants we find. Accumulations of dust, dirt, pollen and pet hair and dandruff are carefully loosened and removed from the surfaces that they are attached to with the use of fine precision tools for maximum effectiveness and safety. Then the loosened accumulations are extracted with powerful vacuums, safely of course. If mold and mildew are present inside the ducts, they'll be removed with the use of specially designed UV cleansers which are completely safe for people and household pets. Our job will be completed with sanitizing. The surface of your air ducts will be applied with special substances that will prevent particle accumulation and microbial growth in the near future. You can rest assured that all materials our technicians use are completely safe as well as highly potent. You'll be able to notice the improvement of your indoor air quality almost immediately, as the air will be fresher, cleaner, and much easier to breathe. Don't wait for someone in your household to start developing respiratory issues. Call our experts at Air Duct Cleaning San Ramon right away.